To co-incide with the 50th anniversary of Doctor Who, Lakeland have launched a range of bakeware perfect for all fans of the sci fi cult series. 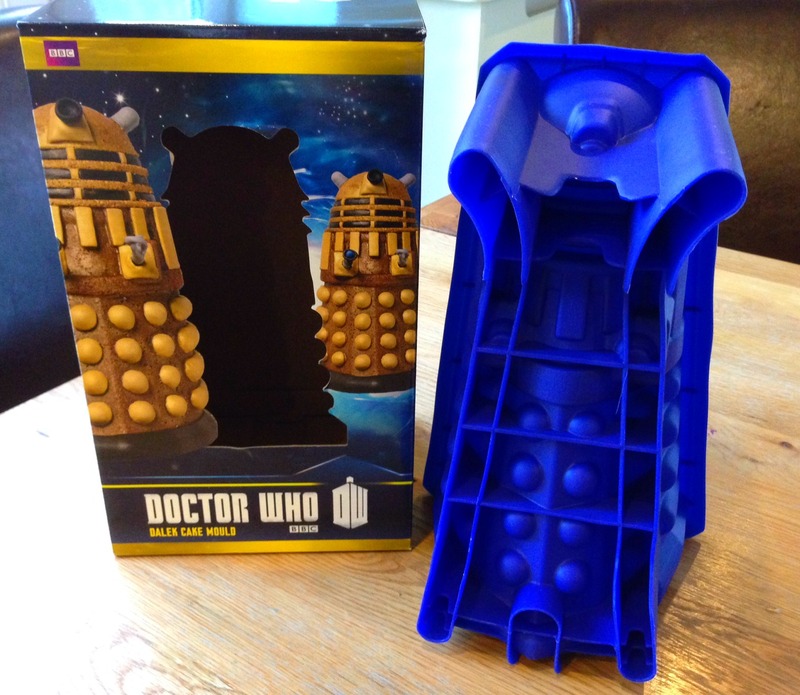 I was sent a couple of items but the main one was the (exclusive to) Lakeland Dalek cake mould. Having seen another blogger bake this cake a couple of weeks ago, I had an idea of what the baked cake would look like but even so I was still nervous and wondering if the cake would come out of the mould intact! Luckily it did, bar the ‘ears’ see below, thanks to some cake release which I applied liberally! The next conundrum was trying to fathom out the best way of decorating it. .Having googled ‘dalek’ images I discovered that the modern day daleks are much more colourful than the ones from my youth. However, not being very skilled at using fondant icing I decided to keep my cake simple. I baked a chocolate cake to create a dark brown coloured dalek and then I simply dusted the cake with edible silver silk. 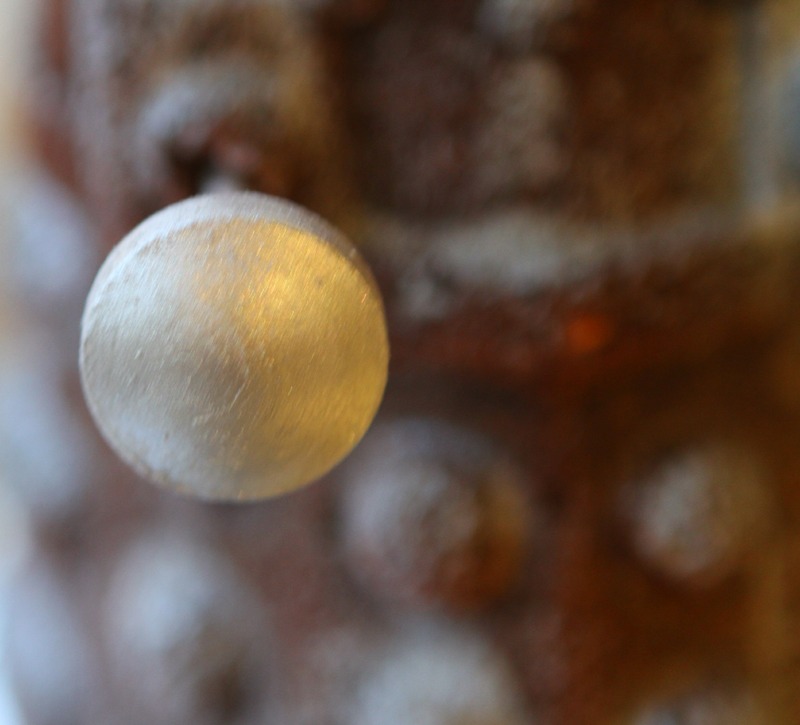 Then I used a Swizel sherbert lollipop and a cake pop stick for the arms and a giant chocolate button, all dusted with the silver silk, for the head sticky outy bit (yes this is a real technical name for it….not!). You will notice that my Dalek Cake is missing its ears – or antennae – they fell off in the mould and I did not have anything to hand to make replacement ones with, so my Dalek is a little….well…unique! But hey I am Mummy Mishap afterall, and here is my Dalek Cake. Then cover the decorative items with the silver silk and add to the cake. And now all that is left to do is get a knife and EXTERMINATE that Dalek cake!! 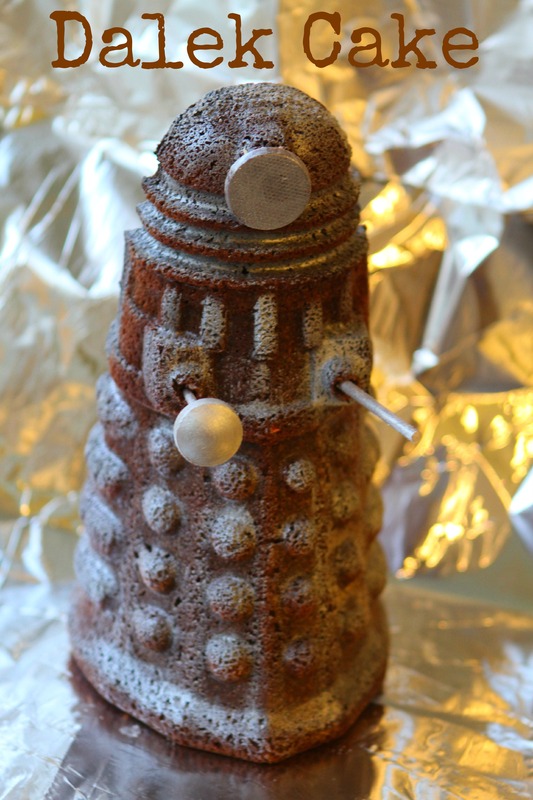 I was sent a Dalek Cake Mould, edible silver silk and cake release from Lakeland for the purpose of the review. The recipe is my own as is the design of the cake! 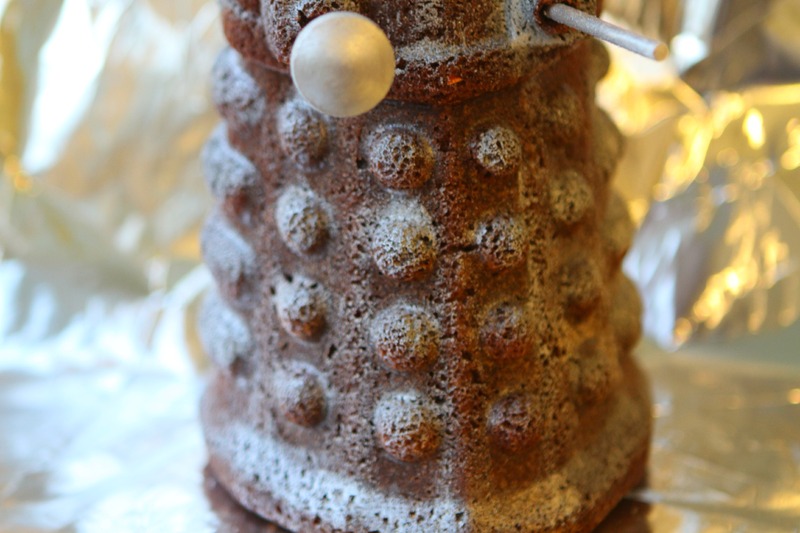 Who knew you could be a cake mold for a Dalek Dr. Who Cake, very cool. Jenny, that is fab!!! I love lakeland. Wow, that is so fabulous! My teenage cousin is a huge Whovian and I promised I’d make him a cake for his birthday, so I may have to do some spending at Lakeland today! That cake is MASSIVELY impressive! Almost too good to eat! WOW, so impressive! I would take one look at that usually and think, nope too ambitious for me, however had no idea such cake moulds even existed! I can’t live without cake release – it really is brilliant and now I don’t think I can live without a dalek cake mould! My OH loves Dr Who so this would be perfect for his birthday. Thank you! I love your Dalek . is yours a lady dale because my Dalek cake is called Dave and he needs a girlfriend. Dr Who fans up and down the country are rejoicing now, your Dalek looks fabulous, I bet the boys loved it. We haven’t discovered Dr Who yet and seeing as I was a scaredy cat in my time I can’t see it happening any time soon. Wow I saw this on fb earlier and was immediately impressed! So simple but effective. Like Mari I was a scaredy cat, but I did meet Peter Davidson when I was about 7 and get his autograph! I LOVE that! amazing… worked really well! That is totally AWESOME SAUCE! I want that tin! Ooh these look FABULOUS! My son’s teacher would be in heaven! Oh that is pure genius. Do you think someone with zero cake baking talent like me could get away with something like this? Oh wow what an awesome cake!! Using a swizzel lollipop is a brilliant idea and you can’t tell about the ears at all.